Name Variation Laureen Fingerhut was also known as Lauren. Laureen Fingerhut was born in 1927. She was the daughter of Samuel Fingerhut and Blanche Hoppe. Laureen Fingerhut died in 1989. Married Name Her married name was Foye. Lucille Marie Fingerhut married Harlan Arthur Foye. Lucille Marie Fingerhut was born on 14 October 1914 at Sauk, Wisconsin. Lucille Marie Fingerhut died on 24 July 1996 at age 81. Harlan Arthur Foye married Lucille Marie Fingerhut, daughter of Samuel Fingerhut and Blanche Hoppe. Harlan Arthur Foye was born on 9 February 1912. He died on 21 May 1978 at Wisconsin at age 66. Margaret Fingerhut married Roger V. Diehl. Margaret Fingerhut was born on 15 February 1925. Margaret Fingerhut died in 1990. Name Variation Roger V. Diehl was also known as R. V.
Roger V. Diehl married Margaret Fingerhut, daughter of Samuel Fingerhut and Blanche Hoppe. Married Name Her married name was Smith. Bernice Clara Fingerhut married Melvin Smith. Bernice Clara Fingerhut was born on 30 October 1912 at Wisconsin. Bernice Clara Fingerhut died on 23 November 1996 at age 84. Melvin Smith married Bernice Clara Fingerhut, daughter of Samuel Fingerhut and Blanche Hoppe. Ernest Fingerhut was born circa 1913 at Wisconsin. He was the son of Samuel Fingerhut and Blanche Hoppe. Ernest Fingerhut died before 1960. Russell Fingerhut was born on 2 November 1916 at Wisconsin. Russell Fingerhut died on 23 October 1955 at Wisconsin at age 38 cause of death: drowned. He was buried after 23 October 1955 at Bethlehem United Methodist Church Cemetery, Black Hawk, Sauk, Wisconsin. [S373] U.S. Federal Census 1940 U.S. Federal Census, by Ancestry.com, Year: 1940; Census Place: Franklin, Sauk, Wisconsin; Roll: m-t0627-04523; Page: 7A; Enumeration District: 56-14. Werner M. Wipperfurth was the son of Werner Wipperfurth. Werner M. Wipperfurth married Mary Ann Brickl, daughter of Anton J. Brickl and Annie M. Lins, on 10 May 1962. Walter Edwin Meyer married Loretta E. Sass. Walter Edwin Meyer was born on 19 December 1906 at Wisconsin. He died on 20 October 1966 at Wisconsin at age 59. Married Name Her married name was Klipp. Elda Magdalene Laura Thies married Arthur Friedrich Klipp, son of Henry John George Klipp and Mary Klitzke. Elda Magdalene Laura Thies was born on 13 January 1902 at Sauk, Wisconsin. She was the daughter of Herman Thies and Anna Catherina Dorothea Meyer. Elda Magdalene Laura Thies died on 4 February 1988 at Wisconsin at age 86. Arthur Friedrich Klipp married Elda Magdalene Laura Thies, daughter of Herman Thies and Anna Catherina Dorothea Meyer. Arthur Friedrich Klipp was born on 17 October 1899 at Sauk, Wisconsin. He was the son of Henry John George Klipp and Mary Klitzke. Arthur Friedrich Klipp died on 6 November 1953 at Wisconsin at age 54. Name Variation Patrick K. Carroll was also known as P. K.
Patrick K. Carroll married Icel Smith. Patrick K. Carroll was born circa 1902 at Cazenovia, Wisconsin. 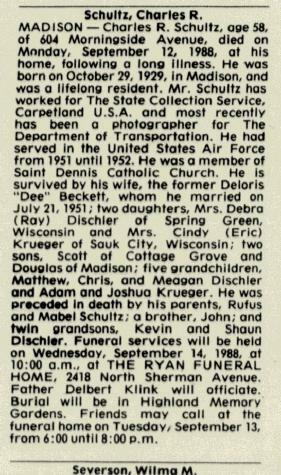 He died on 1 June 1968 at Reedsburg, Sauk, Wisconsin, Madison Wisconsin State Journal June 2, 1968 - Patrick Carroll obituary. Frederick Kohlmeyer was born in April 1869 at Germany. He married Mary (?) circa 1891. 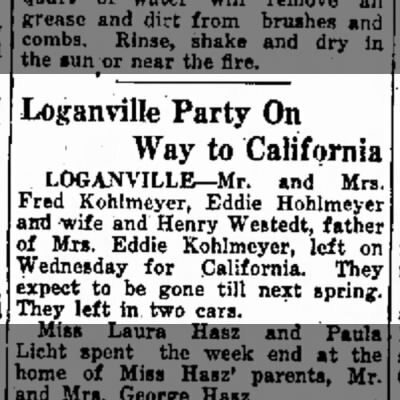 Married Name circa 1891 As of circa 1891,her married name was Kohlmeyer. Mary (?) was born in July 1870 at Germany. She married Frederick Kohlmeyer circa 1891. Frederick Kohlmeyer was born in February 1897 at Wisconsin. He was the son of Frederick Kohlmeyer and Mary (?). On 9 November 1921 Loganville Party on Way to California. 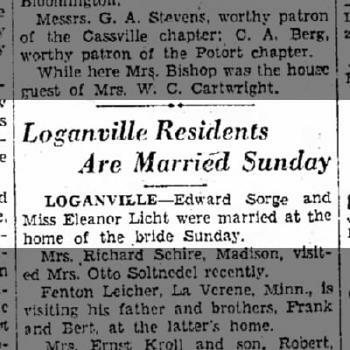 Edward Sorge married Eleanor Licht, daughter of Herman M. Licht and Ida Steckelberg, on 6 April 1930. Leo T. Rancourt died before October 1968. (?) Kohlmeyer was born on 22 February 1922 at California. He was the son of Edward Kohlmeyer and Caroline Westedt. Married Name Her married name was Strobel. Ruth Dettmann married Joseph Strobel. Ruth Dettmann died after June 1959. Joseph Strobel married Ruth Dettmann. Joseph Strobel died before June 1959. Name Variation Charles R. Schultz was also known as Charles P.
Charles R. Schultz was born on 29 October 1929 at Madison, Dane, Wisconsin. He married Deloris Beckett on 21 July 1951. 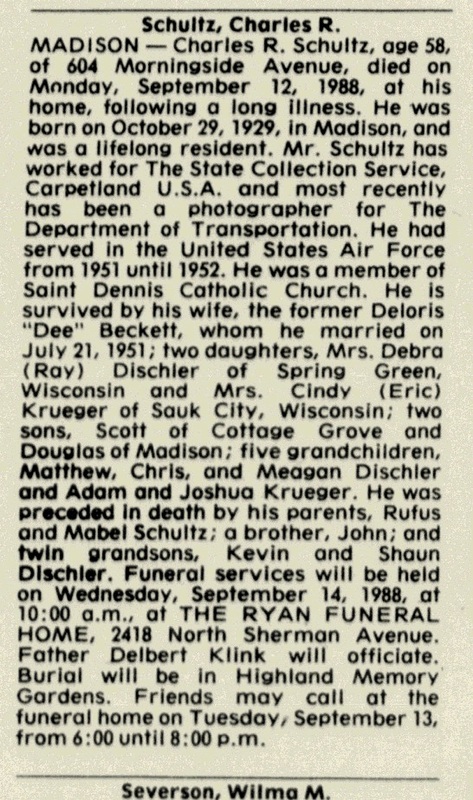 Charles R. Schultz died on 12 September 1988 at Madison, Dane, Wisconsin, at age 58 Charles R Schultz obituary. Max George Laukant married Goldie Martha Crown. Max George Laukant was born on 16 June 1907 at Germany. He died on 26 November 1990 at Reedsburg, Sauk, Wisconsin, at age 83. Wilbert Thurow married Elma (?). Married Name Her married name was Thurow. Elma (?) married Wilbert Thurow. John M. Lohr was born on 31 May 1932 at Baraboo, Sauk, Wisconsin. He was the son of Walter Lohr and Lois Wagner. John M. Lohr died on 2 July 2003 at Sauk, Wisconsin, at age 71 John M. Lohr, age 71, of Troy Township, died on Tuesday, July 2, 2003 at Sauk Prairie Memorial Hospital. He was born in Baraboo on May 31, 1932, the son of the late Walter and Lois (Wagner) Lohr. John graduated from Prairie du Sac High School in 1951. He was united in marriage to Katherine Thies on Aug. 20, 1960. John was a veteran of the U.S. Army, having served from 1955-57, and served with the National Guard/Baraboo Unit until 1961. He was a lifetime farmer in Troy Township and was a member of St. John's Lutheran Church in Leland, the church choir, and served on the church council for many years. He was a member of the Hilltop Gospel Singers, American Saddlebred Horse Association and a 4-H adult leader. He is survived by: his wife, Katherine of Troy Township; a son, Jeffrey Lohr of Sauk City; a daughter, Eloise Lohr of Onalaska; two brothers, Melvin (Doris) Lohr of Prairie du Sac and David (Ruth) Lohr of Prairie du Sac; a sister, Norma (Peter) Lohr of Prairie du Sac; four brothers-in-law, Richard (Dinah) Thies of Slinger, Donald (Joyce) Thies of Madison, Robert Exner of Wisconsin Rapids and Gerald Tietje of San Diego, Calif; many nieces, nephews, other relatives and friends. In addition to his parents, he was preceded in death by: a brother, Robert; a sister, Marion Exner; a sister-in-law, Betty Tietje and special uncle Ed, who served on the farm for many years. A funeral service will be held at St. John's Lutheran Church, Leland at 11 a.m. on Monday, July 7, 2003, with Pastor James Kuemmerle officiating. Burial will be in St. John's Cemetery. Friends may call at GNEWIKOW-HOOVERSON FUNERAL HOME, Sauk City, from 1-4 p.m. on Sunday, July 6, 2003.